We are in the midst of an era of frightening contradictions, when it comes to public understandings of climate change. While climate changes are occurring more quickly than scientists have ever predicted, most people’s knowledge of these realities remains hazy and clouded by political overtones. Because of both the counter-intuitive nature of climate change and the massive misinformation campaigns created by the fossil fuel industry, the general population is 20 years behind most climate scientists when it comes to the straightforward fact of “believing in” climate change. This is an ominous statistic: Now that scientists are predicting that even worse impacts than previously understood will happen significantly sooner, a rapid global response will be necessary for any attempt to stave them off. We are likely closer to irreversible dangerous climate change, if it has not begun already – and in order to take action, there must be a basic public consensus. There is, however, some hopeful news on the technological front if action is taken soon. In 1976, Wallace Broeker was one of the first to suggest climate change could alter our planet harmfully within our lifetimes. Even though a few scientists said we could be headed for an ice age in the 70s, Broeker had already made the connection and those few climate scientists have not talked about a coming ice age in nearly 40 years. Broeker is arguably the grandfather of climate science: he’s been at it for 55 years. One of his first jobs was under Willard Libby, who was awarded the Nobel Prize in 1949 for discovering carbon-14 dating. This rare but predictable form of carbon is radioactive and it completely decays in about 55,000 years. It is because of carbon-14 dating that we know for absolutely certain that the extra carbon dioxide in our atmosphere came from burning fossil fuels. There are many other ways that we know for sure. The physics of the greenhouse effect are easily demonstrated in the lab and even the simplest models from the early 1980s prove their effect. 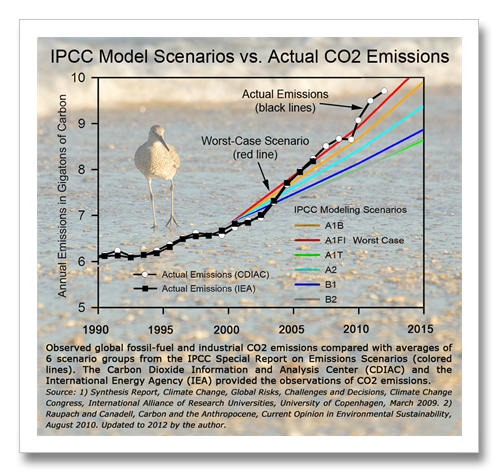 Surprisingly, the complicated high resolution climate models of today yield results that are quite similar to those of the simplest models of the early 1980s. But how are we supposed to trust the models when they can’t even get the seven day forecast correct? Weather models predict what you need to wear to work or school this week. They are built out of the most recent weather data and by the time they run off five or six days into the future, they are often wrong. One can load a climate model up with any old weather data; this week’s, last month’s or last year’s. It doesn’t matter where the models start in time. Climate scientists create scores and hundreds of model runs and then average all of those wrong forecasts together to get average weather. Average weather is climate. Climate is not the seven day forecast. The chaos that makes weather models wrong so quickly is actually what makes climate modeling work so well. These volunteer scientists also did something they normally don’t do this time. They debunked a climate myth. This is the “temperature flattening myth” that is so present in this perceived debate that has become so prevalent in our society. 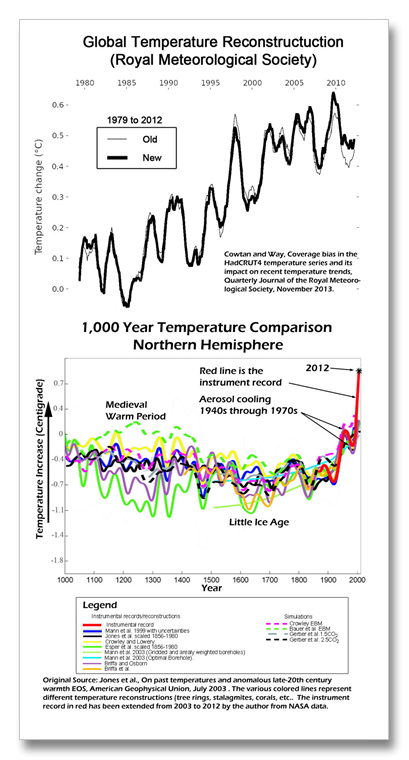 They story goes that earth’s temperature stopped warming in 1998, therefor climate change is not real. In 1998, we had the largest El Nino ever recorded. This massive warming of surface waters in the southern Pacific raised the temperature of Earth in that one year by about 0.15 degrees, or as much as it rose because of global warming in the previous decade. The IPCC 2013 prominently sinks this myth as the fifth statement of fact in their Summary for Policy Makers (SPM): “Trends based on short records are very sensitive to the beginning and end dates and do not in general reflect long-term climate trends.” (3) The mythmakers chose 1998 as the beginning of their myth. This is plain and simple cherry picking. If one looks at the trend beginning in 1997, the temperature rise is anything but flat. If one begins in 1994, the annual rise rivals the fastest rise in the instrumental record from 1976 to 1997. Since 1998, the global temperature record has been broken three times and tied once. The new IPCC report tells us that half of warming (57%) that should have already occurred has been masked by aerosols mostly emitted since the turn of the century in rapidly developing Asian nations (yes, warming would double if cooling smog pollutants were suddenly cleaned up in Asia). (4) The new IPCC report also tells us the deep oceans are now warming whereas before they were not, and ninety percent of actual warming has gone into the oceans (5, 6). If we would have reduced our emissions to 1987 levels by 2012 – as was suggested prudent by the Kyoto Protocol – that would have been all that was needed. In the last 28 years we have emitted as many greenhouse gas pollutants as we emitted in the previous 236 years. (10) Somehow, we must begin to remove some of the load of long-lived greenhouse gases that have been accumulating in our sky. Now that I have put you at ease with the simplicity of the solutions, the hard truth is that this global greenhouse gas experiment has gone horribly wrong. There are discoveries that are extraordinarily important to the discussion of appropriate policy and behavior that are unknown by all but a few. Up until recently, science has not known much about cooling pollutants and the chemical reactions that take place in the atmosphere and clouds, water vapor and indirect effects. Now we know. We used to only understand global warming gases by their test tube signatures on warming. Now we know these complicated things about how everything behaves in the atmosphere and when the math is done, oil is responsible for 2.5 times more warming in the short term than coal. The cooling pollutants are short-lived though, so after twenty years carbon dioxide becomes the king of the warming gases once again. But it is the short term that is crucial. If we cross an abrupt change threshold in the short term, or an irreversible threshold, our goose is cooked. In the long-term, we are far more likely to be able to develop solutions to mitigate for greenhouse gas warming. But if we fail to control radical climate change in the short term, we are toast. There are many more new climate science discoveries than the IPCC reports. Climate change is and has in the past manifested itself in ways that are completely foreign to mankind’s existence on this planet. Welcome to the 21st Century: Aerosols from the East Have Cooled the Planet – A LOT! Rapidly developing Asian nations are emitting far more greenhouse gases and other air pollutants than ever before. China just exceeded the US in emissions in 2006. Just six years later in 2012, they are emitting nearly twice as much as the US (88 percent more). (32) These greenhouse gases are emitted along with other air pollutants like sulfur dioxide. In developing nations, air pollution regulations are not as stringent and a lot more sulfur dioxide is emitted. The wealthiest and most powerful industry in the world perceives itself to be at risk of extinction and has invested literally hundreds of millions of dollars in campaigns to discredit climate science (propaganda campaigns). The propaganda created by these industries uses some of the same exact propaganda people and firms as were used in the smoking debate, the acid rain regulations debate and the ozone depleting chemical regulation debate. They take the 3 percent opinion and promote it endlessly, regardless of how many times these few scientists have been disproven in the literature. By giving the 3 percent equal time to the 97 percent, the media bias their reporting. That and maybe they simply don’t understand the scientists’ press releases when they refer to dendrochronolgists, oxygen isotopes and precession. Broeker, like a few others, has recognized the likelihood that our global society will not be able to end the burning of fossil fuels and strongly advocates, along with emissions reductions, the collection and disposal of climate pollution in very similar ways that we collect and dispose of garbage. We can take it out of coal plant smokestacks, but that is less than half. There is no magic bullet to get the rest from transportation and buildings, and the IPCC says we need to remove more than 100 percent of emissions. We can do this. But there is an academic hurdle to overcome. Using traditional calculations of the heat required for a chemical reaction to occur, CO2 capture from coal burning power plants works because flue gasses are 10 to 15 percent CO2. The typical air concentration is 0.3 percent or about 33 to 50 times less. When the math is done and the pilot flue gas capture tests are costed, it takes $60 a ton to remove CO2 from flue gas and $500 or more per ton for air capture. (63) This argument is very pervasive in industry. They say you can’t beat physics, so air capture is a bust. While valid, this argument is displaced. Broeker puts it this way in his biography Fixing Climate: “If you extract a certain amount of CO2 from the air, you could replace that same amount by burning a fossil fuel without harming the planet.” It takes 170 times more energy to make electricity from the wind as it does from fossil fuels. It is much more efficient to make electricity from coal and then extract carbon dioxide from the wind. (66) Moreover, the new technologies are simply cheaper because they operate at far cooler temperatures. Sky mining is a promising solution to our climate pollution needs. We took it out of the ground and put it in the sky; now we must take it out of the sky and return it to the ground. At $200 per ton of CO2, we can remove 50 ppm CO2 from the atmosphere for $21 trillion. (67) This is $13 trillion less than US military and health care spending from 2000 to 2009 ($34 trillion). Worth repeating an endless number of times, once fully industrialized, the price drops to $20 or $30 per ton. Because half of the CO2 we emit stays in our sky in time frames that matter, once the new solutions are fully industrialized, we can remove 27 years worth of climate pollution from our sky for what the US spends on health care in less than two years. This is $3 or $4 trillion to basically fix climate change – remove 50 ppm CO2 from the sky for no more than the cost of a couple of years of health care… We might have to do this a few or even several times, but the cost would still be something similar to what the US alone has spent on its military and wars since the turn of the century. Please tell your friends. To prevent dangerous climate change, we must now convince the public and our leaders to act decisively and robustly. Simple emissions reductions will no longer prevent dangerous climate change. 2) Even 100 percent emissions reductions will not keep our climate from changing dangerously… SPM, E.8 Climate Stabilization, Climate Change Commitment and Irreversibility, page 20, fourth bullet. 3) IPCC sinks “Flattening Trend Myth”… IPCC 2013, Summary for Policy Makers, B.1 Atmosphere, page 3, third bullet. 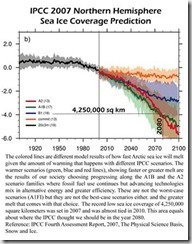 5) Deep Oceans now warming… IPCC 2013 SPM, page 4 B.2 Ocean, bullets 2, 3 and 4. 6) 90% of warming absorbed by the oceans… IPCC 2013 SPM, page 4 B.2 Ocean, first paragraph (box). Greenland ice loss increased 632 percent… SPM, E.3 Cryosphere, page 5, second bullet. Northern Hemisphere snow cover decreased 50%… ibid. page 6, third bullet. 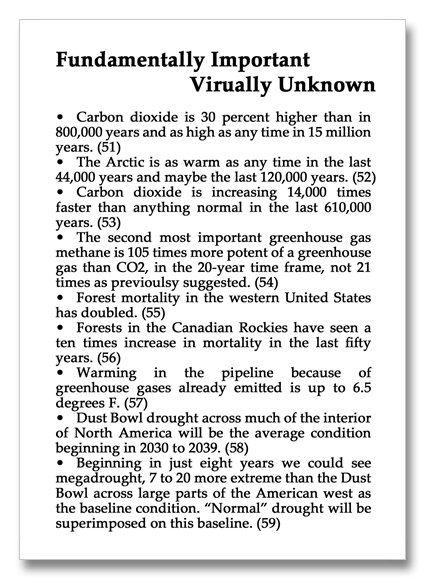 Permafrost warmed 3.6 and 5.2 degrees F in Russia and North America… E.3 Cryosphere, page 6, fourth bullet. Sea level rise rate doubled since 1993… SPM, B.4 Sea Level, page 6, second bullet. Carbon Dioxide, methane and nitrous oxide at highest levels in 800,000 yrs… B.5 Carbon and Other Biogeochemical Cycles, page 7, box. 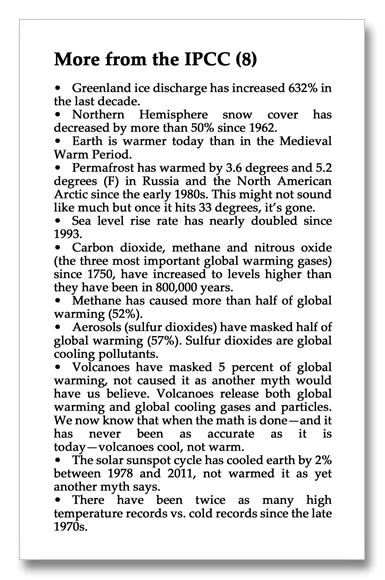 Methane has caused more than half of global warming… SPM, C Drivers of Climate Change, page 9 fourth bullet. 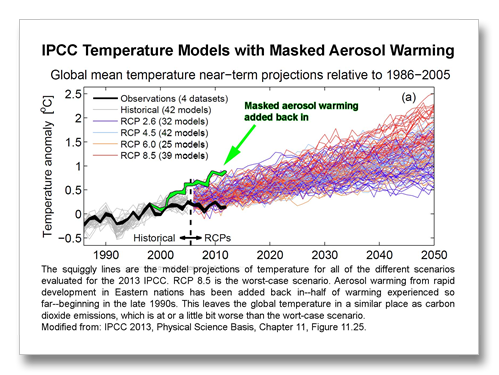 Aerosols have masked half of global warming… SPM, ibid, seventh bullet. Volcanoes have masked 5 percent of warming… SPM, ibid, eighth bullet. Sunspot cycle cooled earth by 2 percent… SPM, ibid, ninth bullet. 9) Brave New Proclamation: Greater than 100 percent emissions reductions… SPM, E.8 Climate Stabilization, Climate Change Commitment and Irreversibility, page 20, fourth bullet. 10) As many emissions in the last 28 years as the previous 236 years… Data from Boden et al., Carbon Dioxide Information Analysis Center, Oak Ridge National Laboratory, June 10, 2011. One half percent… page 83, table 5, 5% discount rate, 450 ppm stabilization, 0.41% GDP (GWP). One percent. Alley, Earth: The Operators’ Manual, WW Norton, 2011, chapter 16: Costs, page 209; costs of water/waterwater infrastructure, page 217. The cost of our global water and wastewater infrastructure is similar to the 1 percent global GDP that the solutions to climate change will cost at about one percent per year. Two percent… STERN REVIEW: The Economics of Climate Change, HMS Treasury, October 2006. Summary of Conclusions, paragraph 6. “The Clean Water and Clean Air Acts each cost about one per cent of GDP”… This is a Quote from Professor Kenneth Caldeira who is an atmospheric scientist that works at the Carnegie Institution for Science’s Department of Global Ecology. Caldeira quote from interview in the New Yorker: Specter, The Climate Fixers, The New Yorker, May 4, 2012, paragraph 38. Agricultural damages… In the U.S. alone we see $485 billion normal weather damages to agriculture every year, 3.4 percent of U.S. GSP in 2008. Lazo et al., U.S. economic sensitivity to weather variability, Journal of the American Meteorological Society, June 2011, summary box. Advertising: We spend $500 billion every year on advertising across the globe… eMarketter, Asia-Pacific Poised to Dominate North America as World’s Top Ad Market, According to ‘Most Comprehensive’ Edition of the eMarketer Global Media Intelligence Report, October 10, 2012, Chart: Total Media Ad Spending Worldwide by Region. $504 billion spent globally on total media ad spending in 2011, $572 projected in 2013. 14) New Climate Paradigm: Oil (Transportation sector) is responsible or 2.5 times more warming than coal (energy sector) in the 20-year time frame… Unger et al., Attribution of climate forcing to economic sectors, Proceedings of the National Academy of Sciences (PNAS), December 2009, page 3384, Figure 1: On-road (transportation) radiative forcing (global warming) of 199 Watts per meter vs. Power (coal) 79 watts per meter = 2.52 times more warming. 15) Professor Wallace Broeker, The Earth Institute, Columbia University… Abrupt climate change quote: See Broeker’s Bio, paragraph 8. Twenty-three times in the last 100,000 years our climate has changed 9 to 14 degrees F globally and 18 to 27 across the Arctic. Sometimes it took millennia, often a century or less and when climate was being pushed the hardest (naturally), as little as a few years. Alley, Wally Was Right – Predictive ability of the North Atlantic Conveyor Belt Hypothesis for Abrupt Climate Change, Annual Review of Earth and Planetary Science, February 2007, Figure 1 shows the 23 abrupt climate changes. Steffensen et al., High-Resolution Greenland Ice Core Data Show Abrupt Climate Change Happens in Few Years, Science Express, June 12 2008, page three, final paragraph. Archer, Fate of fossil fuel CO2 in geologic time, Journal of Geophysical Research, vol. 110, 2005, page 5 of 6, Summary, final Paragraph. 19) Greater than the last 56 million years… “The Pleistocene/Eocene Thermal Maximum (PETM) encompassed warming of 5 degrees C in less than 10,000 years, a rate of change that is 100-fold slower than that projected by RCP8.5.” The PETM occurred 56 million years ago. Diffenbaugh and Field, Changes in Ecologically Critical Terrestrial Climate conditions, Natural Systems in Changing Climates, Science, Special Climate Edition, Volume 341, August 2, 2013, pg 490, first paragraph. Tsai and Ekstrom. Analysis of Glacial Earthquakes, Journal of Geophysical Research, V112, April 2007. McMurtry et al., Giant landslides, mega-tsunamis, and paleo-sea level in the Hawaiian Islands, Marine Geology 2004. 22) The Amazon has flipped from a carbon sink to a carbon source … A personal email to Lewis helped with the math: 2.2 and 1.6 Gt of Carbon (C) were killed in 2010 and 2005. It takes four years for half to decay and another 25 for the rest to decay resulting in 0.475 Gt emissions the first four years spread out non-linearly thereafter. The Amazon normally captures 0.4 Gt C in a non-drought year, so for the first +/- ten years after 2010 emissions will be greater than captured C.
Lewis et al., The 2010 Amazon Drought, Science, February, 2011. 23) West Antarctic Ice Sheet — Dynamical Ice Sheet Disintegration: Sea level rise of over 10 feet in 100 years… During the short warm period before our last 100,000 year-long ice age very similar to what we are experiencing today, marine archeologists tell us a reef called Excaret was suddenly drowned. This reef was in a stable area of the Yucatan Peninsula not affected by subsidence or geologic uplift processes. Corals are very picky about the depth of water that they grow in and the Elkhorn coral in particular was devastated by a sea level jump of 12 feet about 121,000 years ago. This time frame matches fairly well with the most recent collapse known of the West Antarctic Ice sheet from research by the British Antarctic Survey in 2010. The jump happened in a time period similar to that of the life of an elkhorn coral, which is 10 to 20 years. IPCC 2007 Sea level rise… 0.18 to 0.59 meters (7 to 23 inches), Summary for policy Makers, Table 1, page 7. IPCC 2007 Sea level rise… 0.26 to 0.82 meters (10 to 32 inces)m Summary for Policy Makers, Table 2, page 21. 25) Conservative IPCC Consensus … Climate Science Predictions Prove Too Conservative, Scientific American, December 6, 2012, first sentence. 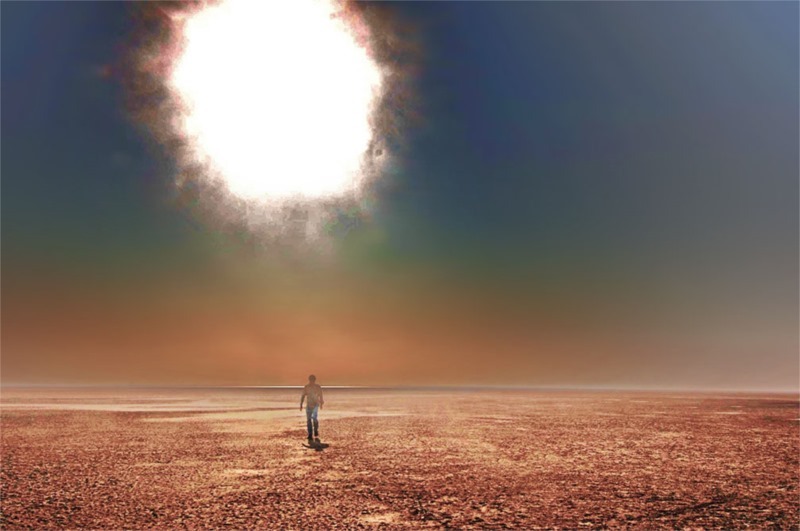 More… “Mass media in the U.S. continue to suggest that scientiﬁc consensus estimates of global climate disruption, such as those from the Intergovernmental Panel on Climate Change (IPCC), are ‘exaggerated’ and overly pessimistic. By contrast, work on the Asymmetry of Scientiﬁc Challenge (ASC) suggests that such consensus assessments are likely to understate climate disruptions.”. Freudenburg and Muselli, Global Warming estimates, media expectations and the asymmetry of scientific challenge, Global Environmental Change, August 2010. Brysse et al., Climate change prediction: Erring on the side of least drama? Global Environmental Change, February 2013. Antarctic surface mass balance (SMB) in the 2007 IPCC Report was supposed to increase, not decrease, for all scenarios, through 2100. 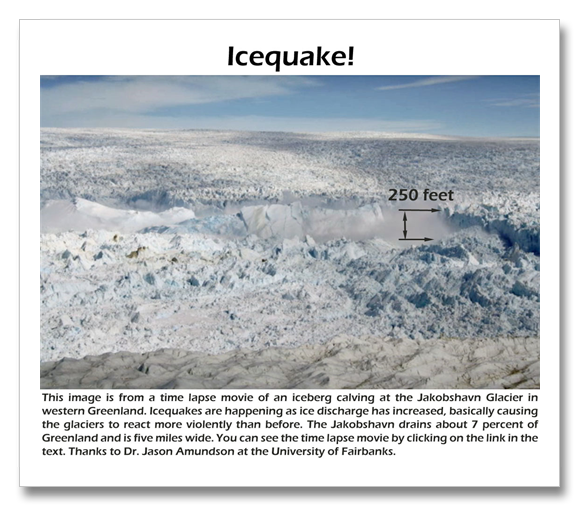 This means that snow accumulation was supposed to be more than melt, evaporation and iceberg discharge combined. Intergovernmental Panel on Climate Change, Fourth Assessment Report, Climate Change 2001: Climate Change 2007: Working Group I: The Physical Science Basis, 10.6.5, Projections of Global Average Sea Level Change for the 21st Century, Table 10.7. The 2013 IPCC report tells us that Antarctic ice loss has almost caught up with Greenland… Summary for Policy Makers, E.3 Cryosphere, page 5, third bullet. 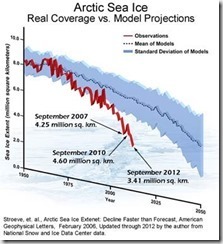 27) Arctic Sea Ice decline 70 years ahead of schedule…v. Summertime melting of Arctic sea-ice has ‘‘accelerated far beyond the expectations of climate models.’’ Allison 2009, p. 7; see also Stroeve et al., 2007). Indeed, using unusually vivid language, the authors note that the record for previous Arctic sea ice summer minimum extent was ‘‘shattered’’ in 2007, ‘‘something not predicted by climate models . . . This dramatic retreat has been much faster than simulated by any of the climate models assessed in the IPCC AR4’’—with summer sea ice now well below the IPCC worst case scenario. Allison 2009, pp. 29–30. Summer minimum sea ice was higher in subsequent years, but still fell near or below the long-term observed downward trend (which, as just noted, declines faster than the model predictions). Then, in 2012, another record minimum was set. Allison et al., The Copenhagen Diagnosis: Updating the World on the Latest Climate Science, University of New South Wales Climate Change Research Center, 2009. Stroeve et al, The Arctic’s rapidly shrinking sea ice cover—A research synthesis, Climatic Change, 110, 1005-1027, 2012, published online June 2011. IPCC Fourth Assessment Report, Technical Basis, Chapter 10 Global Climate Projections, November 2007, page 771. 28) IPCC Sea Level Rise Conservative… The Copenhagen Diagnosis: Updating the World on the Latest Climate Science, University of New South Wales Climate Change Research Center, 2009, Page 7, paragraphs 5 and 6. 29) CO2 worse than the worst-case scenario… CO2 emissions were tracking the high-end scenarios developed in 1999 and applied in AR4, showing that scientists’ ‘‘worst-case scenario’’ has in fact been realized (Allison et al., 2009, p. 9), for the decade before the global financial disruption. Some people have pointed out that the emissions projections were not meant to be reliable in the short term, but it is interesting to note that, so far as these data may be relevant, they fit the pattern of underestimation. 30) In the last 28 years we emitted as many greenhouse gas pollutants as we emitted in the previous 236 years… Data from Boden et al., Carbon Dioxide Information Analysis Center, Oak Ridge National Laboratory, June 10, 2011. 32) China’s greenhouse gas emissions are nearly twice what the U.S. is emitting… Carbon Dioxide Information Analysis center (CDIAC), Latest Published global Estimates 1751-2010 and Preliminary 2011 and 2012 Global & National Estimates. 33) Aerosols have masked half of global warming… IPCC 2013, Summary for Policy Makers, C Drivers of Climate Change, page 9, seventh bullet. 35) Intensifying cold extremes on a warmer planted… Francis and Vavrus, Evidence linking Arctic Amplification to extreme weather in mid-latitudes, Geophysical Research Letters, March 2012. Conclusions, page LO6801, paragraph 15. 36) “All weather events are affected by climate change because the environment in which they occur is warmer and moister than it used to be.” … Trenberth, Framing the way to relate climate extremes to climate change, Climatic Change, March 2012, concluding sentence. 37) Global Warming has Already Doubled the Droughts and Floods in the U.S. Southeast… A Duke University-led team of climate scientists suggests that global warming is the main cause of a significant intensification in the North Atlantic Subtropical High (NASH) that in recent decades has more than doubled the frequency of abnormally wet or dry summer weather in the southeastern United States. Li et al., Changes to the North Atlantic Subtropical High and its Role in the Intensification of Summer Rainfall Variability in the Southeastern United States, Journal of Climate, October 2010, first paragraph. 39) Extreme precipitation events have increased 33% in the U.S… ibid. 40) Atmospheric moisture increased 4% and hourly precipitation extremes double that… ibid, page 3, second column, third paragraph. 41) Floods in England and Wales 20 to 90%… ibid, page 3, second column, fourth paragraph. 42) The one-day and five-day maximum rainfall events increasing across two-thirds… ibid. 43) Spring is coming 10 to 30 days sooner across the American West… Stewart et al., Changes in snowmelt runoff timing on western North America under a business as usual climate change scenario, Climatic Change, 62: 217-232,2004, page 223, fourth paragraph. 44) Increasing wildfires in the American West… a 78-day increase in the length of the fire season and a fourfold increase in the number of fires. A. Westerling et al., Warming and earlier spring increases western U.S. forest wildfire activity, Science, 313, no. 5789 August 2006, page 941 fourth paragraph and third paragraph. 45) Cold waves in Europe and Great Britain caused by climate change… Zhang, Lu and Guan, Weakened cyclones, intensiﬁed anticyclones and recent extreme cold winter weather events in Eurasia, Environmental Research Letters, December 2012, page 6 paragraph 2. 46) More frequent droughts in eastern Africa… Funk, Exceptional warming in the western Pacific-Indian Ocean warm pool has contributed to more frequent droughts in Eastern Africa, Explaining Extreme Events of 2011 from a Climate Perspective, Bulletin of the American Meteorological Society, December 2012, page 1050 first paragraph. 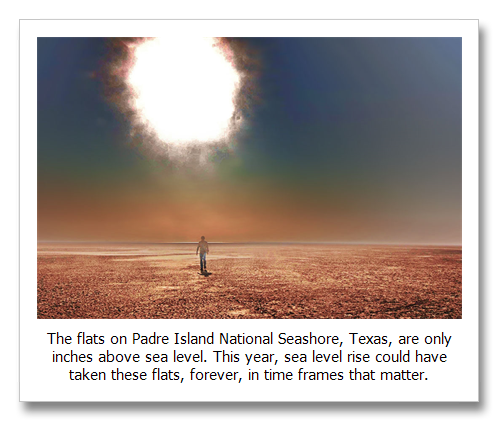 47) The 2011Texas heat wave was 20 times more probable… Rupp and Mote, Did human influence on climate make the 2011 Texas drought more probable? Bulletin of the American Meteorological Society, December 2012, page 1053, paragraph 7. 48) Great Britain hot Novembers 62 times more likely… Massey, Have the odds of warm November temperatures and cold December temperatures in Central England changed? 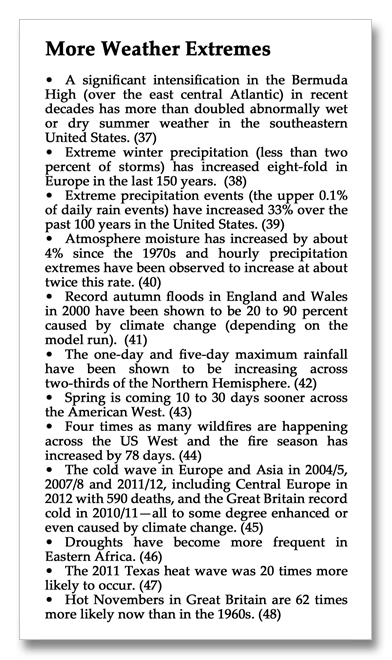 Bulletin of the American Meteorological Society, December 2012, page 1058, paragraph 5. 49) American’s views on climate change are 20 years behind those of the vast majority of climate scientists’… In 1991 only 60% of climate scientists believed that average global temperatures were up (paragraph 16), compared to 97% today (paragraph 4) But only about 60% of the public believes. 58% of the public… American’s Concerns about Global Warming on the Rise, Gallup, April 8, 2013, first graph. 67% of the public… Climate Change: Key Data Points from Pew Research, Pew Resaerch Center, November 5, 2013, fourth graphic. 50) The “Fairness Bias” and climate scientists don’t trust the media… “Through content analysis of US prestige press— meaning the New York Times, the Washington Post, the Los Angeles Times, and the Wall Street Journal—this paper focuses on the norm of balanced reporting, and shows that the prestige press’s adherence to balance actually leads to biased coverage of both anthropogenic contributions to global warming and resultant action.” Boykoff and Boykoff, Balance as Bias Global warming and the US Prestige Press, Global Environmental Change, 2004, abstract. Lichter, Climate Scientists Agree on Warming, Disagree on Dangers, and Don’t Trust the Media’s Coverage of Climate Change, George Mason University, STATS, April 2008, paragraph 12.
and as high as any time in 15 million years… CO2 is a high as any time in the last 15 million years… Tripati, et. al., Coupling of CO2 and Ice Sheet Stability Over Major Climate Transitions of the Last 20 million years, Science Express, October 8, 2009, page 2, second column, second paragraph. 52) Arctic Warmer than any time in the last 44,000 to 120,000 years… “Here we use 145 radiocarbon dates on rooted tundra plants revealed by receding cold-based ice caps in the Eastern Canadian Arctic to show that 5000 years of regional summertime cooling has been reversed, with average summer temperatures of the last ~100 years now higher than during any century in more than 44,000 years, including peak warmth of the early Holocene when high latitude summer insolation was 9% greater than present. Reconstructed changes in snow line elevation suggest that summers cooled ~2.7 °C over the past 5000 years, approximately twice the response predicted by CMIP5 climate models. Our results indicate that anthropogenic increases in greenhouse gases have led to unprecedented regional warmth.” The methodology of this work can only look back 44,000 years. Inferring that earlier part of our most recent ice age back to 120,000 years before present was at least as cold as it was 44,000 years ago gives the 120,000 year number. Abstract only: Miller et al., Unprecedented recent summer warmth in Arctic Canada, Geophysical Research Letters, October 2013. 53) CO2 is increasing 14,000 times faster than the long-term average for the last 610,000 thousand years… Zeebe and Caldeira, Close mass balance of long-term carbon fluxes from ice-core CO2 and ocean chemistry records, Nature Geoscience, Advance Online Publication, April 27, 2008. The 14,000 years quote comes from the University of Hawaii press release for the paper, ninth paragraph. 54) Methane is 105 times more potent in the short term… Shindell et al., Improved Attribution of Climate Forcing to Emissions, Nature, October 2009, figure 2, narrative. 56) Forest Die off in Canada, 10 times greater… mortality increased an average of 4.7 percent per year from 1963 to 2008. Peng et al., A drought-induced pervasive increase in tree mortality across Canada’s boreal forests, Nature Climate Change, November 2011, abstract. Ramanthan and Feng, On avoiding dangerous anthropogenic interference with the climate system-Formidable challenges ahead, PNAS, September 2008, abstract. Dia, Characteristics and trends in various forms of the Palmer Drought Severity Index 1900 to 2008, Journal of Geophysical Research, March 16, 2011, revised. ` See the graphics for 2030 to 2039 in the press release. Dust Bowl drought Palmer Drought Severity Index is -4 to -5. Seager et al., Projections of declining surface water availability for the southwestern United States, Nature Climate Change, December 2012 with comments from Seager.pdf page 5, second paragraph. Megadrought… These droughts were temporary, like the droughts of today, but in the near future, conditions comparable to these droughts will be the average climate condition. Dry periods that we know as drought today will be on top of megadrought dryness. Cook et al., Long Term Aridity Changes in the Western United States, Science, November 2004, page 1017, top of page right column, see Figure 2, page 1016. 60) Climategate Email Scandal: wording taken out of context in stolen emails was widely reported as proving climate scientists were dishonest in their work. Six independent reviews cleared all scientists involved. 61) Himalayan Glaciers: The 2007 IPCC report said that Himalayan glaciers would melt by 2035. There was a simple Scribner’s error. The date should have been 2350. 62) Amazongate: The United Kingdom’s Sunday Times erroneously posted a story about how badly the 2007 IPCC report misrepresented climate change impacts on the Amazon rainforest that made headlines across the world. Five months later with almost no press whatsoever, the Times retracted the entire article and published a 400 word apology. Schmidt, Leakgate: A Retraction, RealClimate, Climate Science from Climate Scientists, June 20, 2010. Goeppert et al., Air as the renewable carbon source of the future – CO2 Capture from the atmosphere, Energy and Environmental Science, May 1, 2012. 64) Cost of Air Capture: $200 per ton initially, $30 per ton fully industrialized… Testimony to the Science, Space and Technology Committee chaired by Lamar Smith, 020410, page 5 first paragraph. 66) If you extract a certain amount of CO2 from the air… Broeker and Kunzig, Fixing Climate: What Past Climates Reveal about the Current Threat and How to Counter It, Hill and Wang, page 202. Hansen et al., Target Atmospheric CO2 Where Should Humanity Aim? Open Atmospheric Science Journal, November 2008, page 226 and 227, Section 4.4 Policy Relevance, page 227, paragraph 1.